We empower students to develop practical skills through a wide range of fun, hands-on classes. Our fully equipped woodshop and professional teaching staff welcome hundreds of people every month, from youth groups and DIY homeowners to team-building and employee training workshops. Classes for the general public in carpentry, woodworking, electrical, plumbing, and more. Youth classes are also available - age ranges are indicated in class descriptions. Team-building, special projects, or private group classes, including youth groups. Choose from our Menu of Classes, or request a custom experience for your group. For employees in construction, deconstruction, or manufacturing. We can train your entry-level employees, or give your sales and admin team better insight into the production side of what your business does. 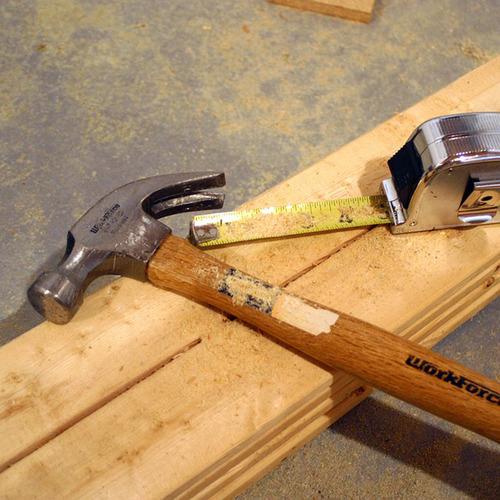 Our ongoing classes include carpentry and woodworking, electrical, and plumbing. Registration info, including limited scholarships and skill levels, is available by clicking on individual classes below. The age requirement for classes is 18+ unless otherwise noted in the class description. You may transfer your ticket to someone 18 or older, and email us (education@rebuildingcenter.org) with their name and email address. If you need help finding someone to take your spot, you are welcome to post in the class event on our Facebook page, or ask us to share your email address with the class waitlist if there is one. We currently do not offer refunds or transfers between classes. Plan to arrive 5-10 minutes before class to settle in and be ready to go! Come in through our administrative entrance (red door across from StormBreaker Brewing and just north of our donation drop-off area). Signs inside the entrance will guide you to the Education Shop. We'll check you in when you arrive. Please note that doors to the shop will close 15 minutes after scheduled start times. Please wear closed-toe shoes with a flat heel, tie long hair back, and avoid any dangling jewelry or baggy clothing. We can't accommodate pets, kids, students impaired by prescription or recreational drugs, or similar safety concerns. If you have a disability, please email us so we can explore safety considerations and possible accommodations. What are my public transportation/parking options? The #4 bus stops within a block of the ReBuilding Center. The Yellow Max Line (Overlook Park stop) is about a 15-minute walk away. There’s also parking available on the surrounding streets. All our classes are 18+ unless otherwise indicated in the class description. Download the youth waiver here. Limited scholarships are offered on every class registration page, and are generously supported by fellow students. Please accept this gift if you need it. Our only request is to limit yourself to one scholarship every 2-3 months to keep these opportunities widely available. There’s a donation option on every class registration page to add any amount that you want to pay forward. A donation receipt will be included with your registration confirmation email. Or to donate without taking a class, visit our donation page. Know someone who would love to take a hands-on class on how to safely and creatively work with used building materials? Purchase a gift certificate in any amount by clicking the “Buy Now” button below (no PayPal account required). For a sense of pricing, check out our current class calendar above. Within 1-3 days, we will send you the gift certificate via email to pass along to your recipient of choice! Each gift certificate will include a unique promo code to use during the class ticket(s) purchase process.